As the seasons change, so do choices in our cuisine. Summer gives way to fall, and with it, the backyard barbecues turn to indoor cooking as grilled steaks turn into roasts of succulent beef or chicken. The slow cooker makes its way out from its summer hibernation becoming a semi-permanent fixture on the countertop and fertile ground for rich stews and warming chilis. Soups are another popular option around this time, and that’s the focus for my debut column at Slowcity. With the rising cost of food, soups are a great way to feed your household a bowl of nutrition on a relatively small budget. One of the most important parts of your soup is the nourishing broth. I’m not talking about the stock found in cans, cartons or cubes you pick up at your local grocery store usually filled with added salt, sugar, gluten, artificial flavours and colour. I’m talking about an easy-to-make broth made from animal bones. This homemade concoction not only adds flavour to your soups but is a rich source of vitamins and minerals to help strengthen digestion, heal the digestive tract and sooth achy joints. Bone broth is also great to sip on when you have digestive issues or are feeling ill.
An excellent cost savings and incredibly healthy way to make your soup broth is to use leftover bones from a previous meal involving beef, chicken or lamb. Or you can choose to buy bones from an ethical source that are free of hormones and antibiotics by visiting a local butcher. One great place to buy your bones locally is at Halenda’s Meats with three locations throughout Whitby and Oshawa. 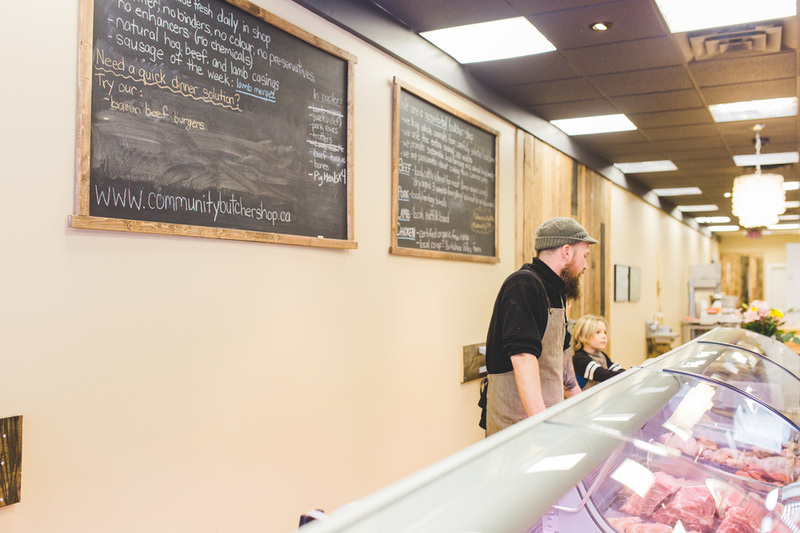 For organic bones it’s worth the short drive to The Community Butcher in Peterborough – a nose to tail butcher where nothing goes to waste – and whose motto is local, ethical and affordable (picture above). Simply toss the bones into a crockpot with 12 cups of water and one tablespoons of apple cider vinegar or lemon juice. Once the water boils turn the crockpot to a lower temperature and simmer anywhere from 12 to 24 hours. This helps to break down the bones to release the nutrients. If you don’t have time to make the bone broth within a few days, put the bones in the freezer and take them out to use when you have time. You can freeze the bone broth in glass jars, leaving at least once inch of space at the top of the jar to allow for expansion. Cool the jars completely without the lid and then freeze. Once the stock is frozen, screw on the lids and place back in the freezer until ready to use. In a large pot over medium heat, sauté the leeks, celery and garlic in the oil until vegetables are soft. Add cumin, cayenne, sea salt and pepper. Add stock and bring to a boil. Reduce heat and add the potato and beans and simmer gently until the potato disappears into the broth – about 20 minutes. Add remaining ingredients and gently simmer another minute or two until the kale is cooked. Serve sprinkled with parmesan cheese if desired. Add extra salt and pepper to taste.